This is a project to build a Borehole Well in Nairobi, Kenya in partnership with BETHLEHEM COMMUNITY CENTRE. In 2006, BCC was asked to take over a children’s home in Mwea (about an hour away). The people who had been running it exhausted their means, and just abandoned it and the children living there. The starving children were left to fend for themselves. BCC sent food and staff, and have adopted this home as one of their own. The buildings are in need of repair, but at least now the children are being cared for, and most are attending school. We have an urgent need for sponsors for these children, as taking on these extra children has stretched the operating funds of Bethlehem very thin. BCC plans to replicate the successful Bethlehem Community Centre on a 40-acre property they have acquired at Lukenya, 35 km from Nairobi city. Twenty (20) acres will be used for food production to supply Bethlehem, Mwea, and Lukenya. Eventually a children’s home; a medical clinic; primary, secondary and vocational schools; and a community hall will be built on the remaining 20 acres. The land has been purchased, at a cost of $175,000.00 USD and fenced. The next step is to drill the well and get crops planted. The farm will produce food for the children, and a surplus to sell – thus contributing to the long-term goal of self-sustainability. 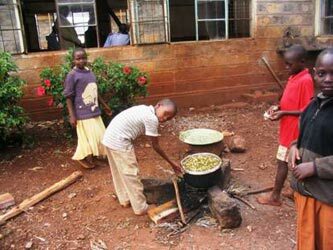 Provision of food and shelter are the very basic challenges facing most orphanages. A priority at Bethlehem is to take measures to ensure food supply sustainability. The parcel of the land at Lukenya is the first step towards this crucial goal. Lukenya is in a semi-arid belt of Kenya. There is very little annual rainfall; the nearby river does not supply enough water for the large population dependent upon it. Studies have shown that irrigation is necessary to farm in this region. A geological survey has been carried out, indicating that a borehole well is the only water source that will provide 10m (3)/hr required for irrigation and domestic use. Shallow wells have been dug in the area, but they provide very little if any water. The survey further identified the prime site to drill the well to gain access to enough water. Currently, $62,500.00 is spent annually to feed the two hundred children at both orphanages. It is estimated that the cultivation of the 20 acres would reduce this expenditure by 85%. As Lukenya is developing as a suburban settlement, water could be sold to residents, providing an additional source of income, until such time as the government develops a water provision system for them. Also, the Home would not have to purchase water from another source for their needs, which is another expenditure that would not be necessary with the existing well. The site has already identified and been certified by the geologists. The next step is to drill the well and install its equipment. Also required is a source of power to run the pump, and a storage tank to hold the pumped water for redistribution. Then the network of pipes must be laid for irrigation of the farm land. Electricity has been identified as the best source of power for the pump. The hydro lines are about 2 km away. As a back-up, a diesel engine will also be installed for times of electrical power failure. The storage tank will be raised on a tower, providing the gravity necessary for the water distribution through the pipes. Drip pipes will also be installed, as Lukenya is hot and windy, contributing to high evaporation rates. The drip method of irrigation will mitigate the evaporation. Although the well is an expensive project, the long-term benefits cannot be over-emphasized. This well will provide the foundation for not only food supply security, but also substantial savings in the operating budget for both homes, and income provision for long-term sustainability. Primary School at Mwea. The children attend a school about 5 kms away, which is a fair distance for young children to walk each day. Our own school would be more convenient, allow control over the atmosphere and curriculum, be safer for the children, and provide income as children from the surrounding community attend. The costs have not yet been estimated. Second floor of classrooms at the planned Secondary School in Bethlehem. The cost has not yet been determined. These projects will all produce income for the homes, and reduce the reliance on Western donors.